Prognostication and risk assessment are essential for treatment decision-making, patient counseling, and determination of eligibility for clinical trials. More than most other malignancies, urothelial carcinoma of the bladder cancer (UCB) is a highly aggressive and heterogeneous disease with high prevalence and disease recurrence rates. 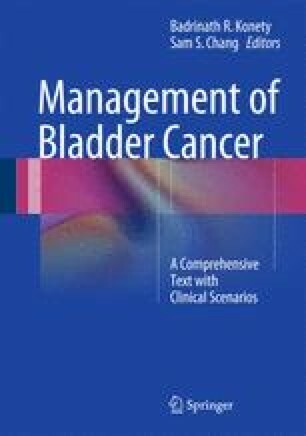 In patients with non-muscle invasive bladder cancer (NMIBC), prognosticators of outcomes and predictive tools providing useful risk estimates in UCB patients could help in the decision-making regarding follow-up scheduling, administration of intravesical instillation therapies, and/or early radical cystectomy (RC). In patients with muscle-invasive bladder cancer (MICB) who underwent RC, an accurate prediction of the presence of lymph node metastasis and the probability of disease recurrence is essential for selecting patients who might benefit from adjuvant systemic chemotherapy. Here, we aimed to give an overview of the prognostic factors and currently available prediction tools associated with UCB outcomes in NMIBC, MIBC, and metastatic UCB.